SELECTION is truly unique. Designed to accommodate novices and advanced users alike, it promises exceptional comfort in movement path and training position. Contoured seats and backrests and dual grip options make SELECTION the perfect fit for every user. 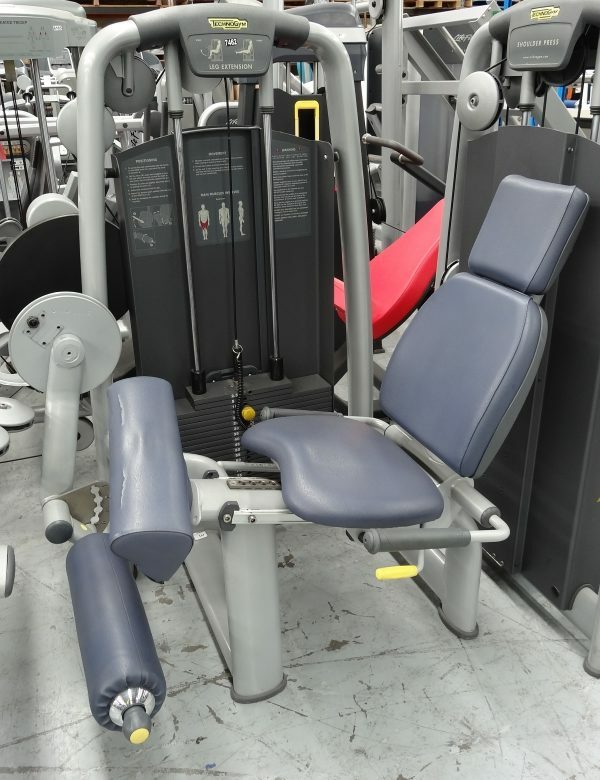 And with over 30 types of equipment in the line, the user can train the muscles most suited to meeting their goals. Leg Extension: The anatomical shape of the thigh support cushion minimizes pressure on the knee. The exercise position can be adjusted while seated. The ROM lever activation button adjusts the starting angle from the seated position. Adjustable tibia roller pad accommodates users of every height. Visual Setup: The levers, buttons and pins are bright yellow and extremely visible, so even the most inexperienced user can easily spot and correctly set up the equipment, without help from a trainer. Ergoadjustment: The number of settings required before starting exercise is extremely low and all adjustments can be easily reached from the workout position. Also, wherever possible, the same adjustment controls are located in the same position on each machine. The easy start device enables a convenient exercise starting position and full control of the movement on select pieces. Smart Pin: This feature is integrated into the top of the weight stack and allows the user to select an additional incremental plate that is half the weight of those in the rest of the stack. This makes it possible for users to more gradually increase their load. Biomotion: This concept, developed by Technogym’s R&D Centre, is based on an extensive study of the functional anatomy of single muscles and their behavior in compound movements. The application of these studies to our selectorized equipment has resulted in a design that reproduces the natural movement of the body through a selected range of motion. Resistance remains steady during the entire range of motion, making the movement exceptionally fluid. Physiocam: This feature allows variable resistance to be delivered to accommodate the specific strength curve of the muscle group being trained, and allows users to perceive consistent resistance throughout the entire exercise. The low initial load enabled by the cam design is in alignment with the strength curve, as muscles are weakest at the beginning and end of their range of motion and strongest in the middle. This feature is beneficial to all users, and particularly for those who are deconditioned or rehab patients. Bioseat: The ergonomic seat and two piece backrest are anatomically shaped to support the spinal column and to help users assume the correct position during their workout. Different densities of padding have been used to best accommodate the shape of the body, offering soft or firm support where needed. The wide, comfortable shape accommodates larger users, while the reduced height from the ground enables easy access to shorter users. Hygienic Comfort: The Towel Locking Device offers a simple solution for holding the towel in place on the equipment, preventing direct contact with the upholstery and keeping it clean and dry for the next user. Leg Extension for sale, feel free to enquire above.